Prices exclusive of VAT but inclusive postage and handling charges. Waterproof concrete structures have proved their worth on numerous occasions in recent years and are to be found in many areas of structural engineering, building and industrial construction, river and marine works and civil engineering. 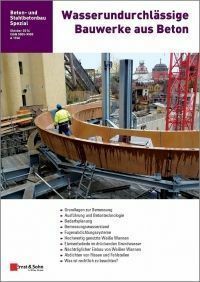 The current state of knowledge about waterproof concrete construction is described in detail in this special issue. The specialist articles cover all the essential fields, starting with the design basics, concrete technology and construction considerations, and questions regarding the design of jointing sealing systems, waterproof basements and double wall elements to the waterproofing of cracks and defects and legal questions.